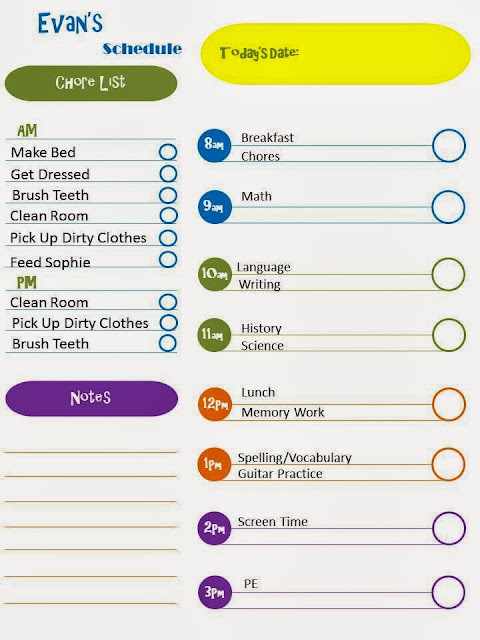 As flexible as homeschooling is, we do try and keep a daily schedule. I have been meaning to get one printed out for the boys as I feel like they are old enough to keep up with their own schedule now. Plus, I think it builds discipline. I'm sure we won't always get to math right at 9 am. And that's ok. But it keeps us focused and accountable for the time we have. I slid this schedule into a page protector and keep a dry erase marker close so I can make notes for special things like guitar lessons or just little happy notes. I also change the date and then the boys can check off the work as they go. I'm so looking forward to seeing how this simplifies our day! Instead of them having to ask what to do next, it's all written out for them. I created this file in PowerPoint and would love to share it. It's completely customizable. You can get the file HERE. You will need to download it in order to make changes yourself. Thanks for sharing your schedule!! I love it! Ohhh sometimes I really wish I home schooled. Great schedule! I love any kind of organization too, this included! I also love that you home school your spending he valuable years with your kids!